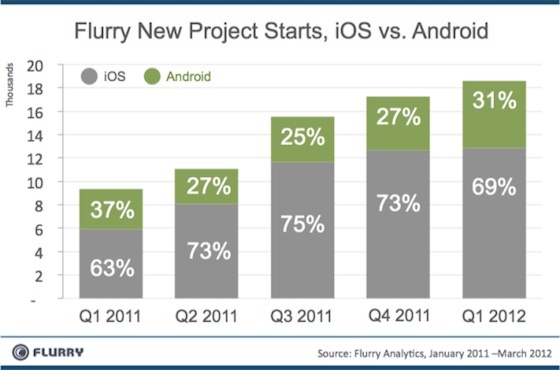 Flurry Analytics today released a new report highlighting developer interest in iOS and Android as measured by downloads of Flurry's tools for integrating analytics into apps. With a new high of over 18,000 SDK downloads by developers during the first quarter of 2012, Flurry found that iOS continues to hold a substantial lead over Android with 69% of those downloads being for iOS. For every 10 apps that developers build, roughly 7 are for iOS. While Google made some gains in Q1 2012, edging up to over 30% for the first time in a year, we believe this is largely due to seasonality, as Apple traditionally experiences a spike in developer support leading up to the holiday season. Apple’s business has more observable seasonality. Flurry points to Apple's dominance in the tablet market as one significant driver of its popularity with developers, with Flurry's numbers showing that the iPad accounted for 88% of all user sessions on tablets during the first five months of 2012. Samsung's Galaxy Tab placed second with just 9% of the market with Amazon's Kindle Fire representing 3%. Flurry also offers data on fragmentation within the Android ecosystem, illustrating how both multitude of devices and operating system versions leads to developers having to design their apps to be compatible with an increasingly complex variety of user setups. Looking at revenue generation, Flurry calculates that for every dollar of revenue per active user generated on iOS, a developer can only expect to earn 24 cents on Android, demonstrating the main reason why developers continue to choose iOS as their first priority for app development. At the end of the day, developers run businesses, and businesses seek out markets where revenue opportunities are highest and the cost of building and distributing is lowest. In short, Android delivers less gain and more pain than iOS, which we believe is the key reason 7 out of every 10 apps built in the new economy are for iOS instead of Android. Flurry's report comes as TechCrunch reminds readers of Google Chairman Eric Schmidt's claim from December stating that within six months most developers would choose to develop for Android as their first priority. With six months having passed and developers clearly still choosing iOS first, TechCrunch reaches a similar conclusion that fragmentation, particularly on the operating system side, has been a major contribution to Android app development falling short of Schmidt's predictions. Most notably, seven months after the launch of Android 4.0 Ice Cream Sandwich, Google's own data reveals that only 7.1% of Android phones are running the latest operating system, a number in line with that observed by Flurry. In contrast, iOS 5 is reported to be installed on 75-80% of active devices as measured from a sample of downloads from the popular Audiobooks application. It comes down to would you rather develop for one screen size or for 20? Most notably, seven months after the launch of Android 4.0 Ice Cream Sandwich, Google's own data reveals that only 7.1% of Android phones are running the latest operating system, a number in line with that observed by Flurry. In contrast, iOS 5 is reported to be installed on 75-80% (http://david-smith.org/blog/2012/05/11/ios-5-dot-1-1-upgrade-stats/) of active devices as measured from a sample of downloads from the popular Audiobooks application. I just feel this is worth repeating. In the long run, it does appear that the sandbox at apple has nicer children to play with. Less fragmentation = less work for a developer. It is insane that only 10% of android users will have ics when the next major release comes out. Apple probably did that in twelve hours. If I tell a complete stranger with an iPhone "I have an app check it out" there is a good chance he'll buy it. If I tell my best friend of 30+ years with a droid "I have an app check it out" "Sorry man I don't buy apps, not even sure how to go about it"
Apple has made everyone realize apps, songs, etc. have value and 99 cents isn't too much of a price to pay. Android and more so Google is about FREE. No one buys anything Google makes (Android, Gmail, maps, etc) this also extends to the apps, it's like a culture of free. If I have no hope of selling my app then I'm not going to make apps for Android. For me it's that simple. Other complaints about android are meaningless to me. I'm not talking about a $0 after contract deal. I'm talking about a BOGO. I've never seen the iPhone offered in a "Buy One Get One" free deal. I've never understood BOGO. If I only need ONE phone, it actually DISCOURAGES me from the offer. Because, I can't just take the 2nd phone for free with no-strings-attached. I need to use that phone on another line. If I could use it as a backup phone in case mine died, okay - but I've never seen it offered that way. Whenever I see a $99 phone on a BOGO, I ask - well, why can't I have just ONE phone for $49?